March 23, 2014 : Akshay Kumar, 25, knew his journey would be tough. But he thought he was prepared. In 2012, after an engineering degree and a oneyear stint with a multinational, Kumar felt he needed a makeover. "I didn't want to be stuck with civil engineering all my life. I also wanted to see the world and explore new options," he recalls. Doing an MBA from a premier institute was on his mind. He did think of the Indian Institutes of Management (IIMs) and the Xavier School of Management, but the desire for global exposure pushed him to explore options overseas. Kumar settled for a oneyear post-graduate course at the Imperial University in the UK, which he financed via an education loan. "Visa rules and the bleak job market there did weigh on my mind. But I had a feeling I could manage it," he says. He had confidence in Imperial's good global ranking, its alumni network and his own hard work. Kumar began his hunt for a job virtually from the day he landed in the UK. He studied hard to get good grades but worked even harder to find a good job. By tapping into networks of his alumni, friends and family, Kumar reckons he would have reached out to over 200 firms during that year. "It didn't work. My good grades made me eligible for plenty of jobs, but my non-European Indian passport was the problem," he shrugs. Kumar moved back to India late last year and has just landed a job with a private equity firm. "All my plans have been delayed by five years," he says. Close to half his salary today goes in paying monthly instalments on his education loan. The West has a problem. Its economy is in a funk, not enough jobs are being created, cautious companies aren't hiring too many, and worried governments — from the US to the UK — are raising visa barriers for foreigners to work in their countries. 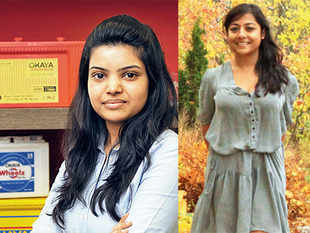 Young Indians, who went overseas for education, are facing a tough time finding a job. Many like Kumar have returned home. And some are now casting the net wider — looking for jobs from the US to Hong Kong and Singapore — or settling for sub-optimal options. Rupa Chanda, professor, IIM-Bangalore, who has worked on reports on international student mobility, says visa and immigration is the biggest factor affecting Indian students' decisions. The US, the UK and Australia — the three most popular destinations for Indians seeking global education — have seen the number of Indian students come down over the past few years (see Out of Favour?). Remember, many Indian students take hefty education loans to finance their studies abroad. While many would find decent jobs back in India that would not help much as these students need dollar salaries to comfortably service their loan. This is taking its toll. "Overseas education is costly. Many Indian students are doing a cost-benefit analysis to figure how to recoup their investments overseas and putting off their plans [to study there]," explains New York-based Rahul Choudaha, chief knowledge officer, World Education Services (WES), a non-profit organization that provides credential evaluations for international students planning to study or work in the US and Canada. But to be fully able to understand how this trend will play out, one must understand the backdrop. A big generational shift is taking place among the students looking for overseas education. Many of them now are India's liberalization children, who have grown up post-1991 and lived in an increasingly global world with fewer barriers.